A wind turbine is a machine that converts the wind's kinetic energy into rotary mechanical energy, which is then used to do work. In more advanced models, the rotational energy is converted into electricity, the most versatile form of energy, by using a generator. For thousands of years people have used windmills to pump water or grind grain. Even into the twentieth century tall, slender, multi-vaned wind turbines made entirely of metal were used in American homes and ranches to pump water into the house's plumbing system or into the cattle's watering trough. After World War I, work was begun to develop wind turbines that could produce electricity. Marcellus Jacobs invented a prototype in 1927 that could provide power for a radio and a few lamps but little else. When demand for electricity increased later, Jacobs's small, inadequate wind turbines fell out of use. The first large-scale wind turbine built in the United States was conceived by Palmer Cosslett Putnam in 1934; he completed it in 1941. The machine was huge. The tower was 36.6 yards (33.5 meters) high, and its two stainless steel blades had diameters of 58 yards (53 meters). Putnam's wind turbine could produce 1,250 kilowatts of electricity, or enough to meet the needs of a small town. It was, however, abandoned in 1945 because of mechanical failure. With the 1970s oil embargo, the United States began once more to consider the feasibility of producing cheap electricity from wind turbines. In 1975 the prototype Mod-O was in operation. This was a 100 kilowatt turbine with two 21-yard (19-meter) blades. More prototypes followed (Mod-OA, Mod-1, Mod-2, etc. ), each larger and more powerful than the one before. Currently, the United States Department of Energy is aiming to go beyond 3,200 kilowatts per machine. Many different models of wind turbines exist, the most striking being the vertical-axis Darrieus, which is shaped like an egg beater. The model most supported by commercial manufacturers, however, is a horizontal-axis turbine, with a capacity of around 100 kilowatts and three blades not more than 33 yards (30 meters) in length. Wind turbines with three blades spin more smoothly and are easier to balance than those with two blades. Also, while larger wind turbines produce more energy, the smaller models are less likely to undergo major mechanical failure, and thus are more economical to maintain. Wind farms have sprung up all over the United States, most notably in California. Wind farms are huge arrays of wind turbines set in areas of favorable wind production. The great number of interconnected wind turbines is necessary in order to produce enough electricity to meet the needs of a sizable population. Currently, 17,000 wind turbines on wind farms owned by several wind energy companies produce 3.7 billion kilowatt-hours of electricity annually, enough to meet the energy needs of 500,000 homes. A wind turbine consists of three basic parts: the tower, the nacelle, and the rotor blades. The tower is either a steel lattice tower similar to electrical towers or a steel tubular tower with an inside ladder to the nacelle. 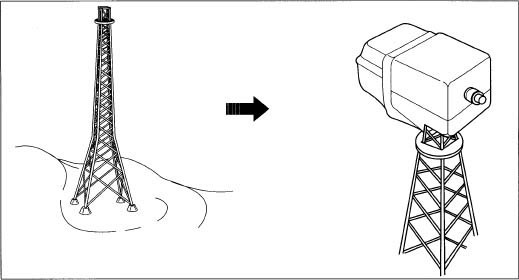 The first step in constructing a wind turbine is erecting the tower. Although the tower's steel parts are manufactured off site in a factory, they are usually assembled on site. The parts are bolted together before erection, and the tower is kept horizontal until placement. A crane lifts the tower into position, all bolts are tightened, and stability is tested upon completion. Next, the fiberglass nacelle is installed. Its inner workings—main drive shaft, gearbox, and blade pitch and yaw controls—are assembled and mounted onto a base frame at a factory. The nacelle is then bolted around the equipment. At the site, the nacelle is lifted onto the completed tower and bolted into place. Most towers do not have guys, which are cables used for support, and most are made of steel that has been coated with a zinc alloy for protection, though some are painted instead. The tower of a typical American-made turbine is approximately 80 feet tall and weighs about 19,000 pounds. The nacelle is a strong, hollow shell that contains the inner workings of the wind turbine. Usually made of fiberglass, the nacelle contains the main drive shaft and the gearbox. It also contains the blade pitch control, a hydraulic system that controls the angle of the blades, and the yaw drive, which controls the position of the turbine relative to the wind. The generator and electronic controls are standard equipment whose main components are steel and copper. A typical nacelle for a current turbine weighs approximately 22,000 pounds. The most diverse use of materials and the most experimentation with new materials occur with the blades. Although the most dominant material used for the blades in commercial wind turbines is fiberglass with a hollow core, other materials in use include lightweight woods and aluminum. Wooden blades are solid, but most blades consist of a skin surrounding a core that is either hollow or filled with a lightweight substance such as plastic foam or honeycomb, or balsa wood. A typical fiberglass blade is about 15 meters in length and weighs approximately 2,500 pounds. Wind turbines also include a utility box, which converts the wind energy into electricity and which is located at the base of the tower. Various cables connect the utility box to the nacelle, while others connect the whole turbine to nearby turbines and to a transformer. The nacelle is a strong, hollow shell that contains the inner workings of the wind turbine, such as the main drive shaft and the gearbox. It also contains the blade pitch control, a hydraulic system that controls the angle of the blades, and the yaw drive, which controls the position of the turbine relative to the wind. A typical nacelle for a current turbine weighs approximately 22,000 pounds. heating increases the consumption of electrical power. Wind farms work best in open areas of slightly rolling land surrounded by mountains. These areas are preferred because the wind turbines can be placed on ridges and remain unobstructed by trees and buildings, and the mountains concentrate the air flow, creating a natural wind tunnel of stronger, faster winds. Wind farms must also be placed near utility lines to facilitate the transfer of the electricity to the local power plant. 1 Wherever a wind farm is to be built, the roads are cut to make way for transporting parts. At each wind turbine location, the land is graded and the pad area is leveled. A concrete foundation is then laid into the ground, followed by the installation of the underground cables. These cables connect the wind turbines to each other in series, and also connect all of them to the remote control center, where the wind farm is monitored and the electricity is sent to the power company. 2 Although the tower's steel parts are manufactured off site in a factory, they are usually assembled on site. The parts are bolted together before erection, and the tower is kept horizontal until placement. A crane lifts the tower into position, all bolts are tightened, and stability is tested upon completion. 4 Aluminum blades are created by bolting sheets of aluminum together, while wooden blades are carved to form an aerodynamic propeller similar in cross-section to an airplane wing. 5 By far the greatest number of blades, however, are formed from fiberglass. The manufacture of fiberglass is a painstaking operation. First, a mold that is in two halves like a clam shell, yet shaped like a blade, is prepared. Next, a fiberglass-resin composite mixture is applied to the inner surfaces of the mold, which is then closed. The fiberglass mixture must then dry for several hours; while it does, an air-filled bladder within the mold helps the blade keep its shape. After the fiberglass is dry, the mold is then opened and the bladder is removed. Final preparation of the blade involves cleaning, sanding, sealing the two halves, and painting. 6 The blades are usually bolted onto the nacelle after it has been placed onto the tower. Because assembly is easier to accomplish on the ground, occasionally a three-pronged blade has two blades bolted onto the nacelle before it is lifted, and the third blade is bolted on after the nacelle is in place. 7 The utility box for each wind turbine and the electrical communication system for the wind farm is installed simultaneously with the placement of the nacelle and blades. Cables run from the nacelle to the utility box and from the utility box to the remote control center. Unlike most manufacturing processes, production of wind turbines involves very little concern with quality control. Because mass production of wind turbines is fairly new, no standards have been set. Efforts are now being made in this area on the part of both the government and manufacturers. While wind turbines on duty are counted on to work 90 percent of the time, many structural flaws are still encountered, particularly with the blades. Cracks sometimes appear soon after manufacture. Mechanical failure because of alignment and assembly errors is common. Electrical sensors frequently fail because of power surges. Non-hydraulic brakes tend to be reliable, but hydraulic braking systems often cause problems. Plans are being developed to use existing technology to solve these difficulties. Wind turbines do have regular maintenance schedules in order to minimize failure. Every three months they undergo inspection, and every six months a major maintenance checkup is scheduled. This usually involves lubricating the moving parts and checking the oil level in the gearbox. It is also possible for a worker to test the electrical system on site and note any problems with the generator or hookups. A wind turbine that produces electricity from inexhaustible winds creates no pollution. By comparison, coal, oil, and natural gas produce one to two pounds of carbon dioxide (an emission that contributes to the greenhouse effect and global warming) per kilowatt-hour produced. When wind energy is used for electrical needs, dependence on fossil fuels for this purpose is reduced. The current annual production of electricity by wind turbines (3.7 billion kilowatt-hours) is equivalent to four million barrels of oil or one million tons of coal. Wind turbines are not completely free of environmental drawbacks. Many people consider them to be unaesthetic, especially when huge wind farms are built near pristine wilderness areas. Bird kills have been documented, and the whirring blades do produce quite a bit of noise. Efforts to reduce these effects include selecting sites that do not coincide with wilderness areas or bird migration routes and researching ways to reduce noise. The future can only get better for wind turbines. The potential for wind energy is largely untapped. The United States Department of Energy estimates that ten times the amount of electricity currently being produced can be achieved by 1995. By 2005, seventy times current production is possible. If this is accomplished, wind turbines would account for 10 percent of the United States' electricity production. Research is now being done to increase the knowledge of wind resources. This involves the testing of more and more areas for the possibility of placing wind farms where the wind is reliable and strong. Plans are in effect to increase the life span of the machine from five years to 20 to 30 years, improve the efficiency of the blades, provide better controls, develop drive trains that last longer, and allow for better surge protection and grounding. The United States Department of Energy has recently set up a schedule to implement the latest research in order to build wind turbines with a higher efficiency rating than is now possible. (The efficiency of an ideal wind turbine is 59.3 percent. That is, 59.3 percent of the wind's energy can be captured. 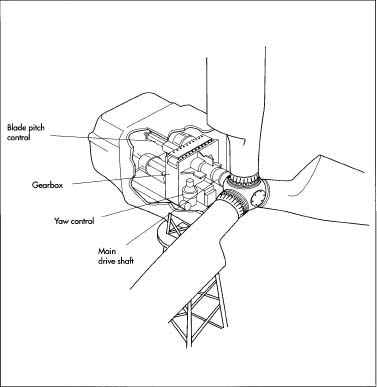 Turbines in actual use are about 30 percent efficient.) The United States Department of Energy has also contracted with three corporations to research ways to reduce mechanical failure. This project began in the spring of 1992 and will extend to the end of the century. Wind turbines will become more prevalent in upcoming years. The largest manufacturer of wind turbines in the world, U.S. Windpower, plans to expand from 420 megawatt capacity (4,200 machines) to 800 megawatts (8,000 machines) by 1995. They plan to have 2,000 megawatts (20,000 machines) by the year 2000. Other wind turbine manufacturers also plan to increase the numbers produced. International committees composed of several industrialized nations have formed to discuss the potential of wind turbines. Efforts are also being made to provide developing countries with small wind turbines similar to those Marcellus Jacobs built in the 1920s. Denmark, which already produces 70 percent to 80 percent of Europe's wind power, is developing plans to expand manufacture of wind turbines. The turn of the century should see wind turbines that are properly placed, efficient, durable, and numerous. Assessment of Research Needs for Wind Turbine Rotor Materials Technology. National Academy Press, 1991. Eggleston, David M. Wind Turbine Engineering Design. Van Nostrand Reinhold, 1987. Hunt, Daniel V. Windpower: A Handbook on Wind Energy Conversion Systems. Van Nostrand Reinhold, 1981. Kovarik, Tom, Charles Pupher, and John Hurst. Wind Energy. Domus Books, 1979. Park, Jack. The Wind Power Book. Cheshire Books, 1981. Putnam, Palmer Cosslett. Power from the Wind. Van Nostrand Company, 1948. Frank, Deborah. "Blowing in the Wind," Popular Mechanics, August, 1991, pp. 40-43+. Mohs, Mayo. "Blowin' in the Wind," Discover. June, 1986, pp. 68-74. Moretti, Peter M. and Louis V. Divone. 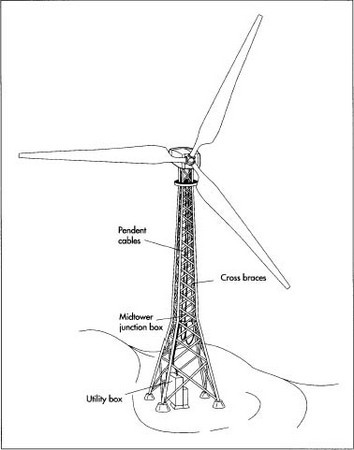 "Modern Windmills," Scientific American. June, 1986, pp. 110-118. Price, Marshall. "Basement-Built Wind Generator," Mother Earth News. July-August, 1986, p. 103. Stefanides, E. J. "Hydraulic Yaw Control Upgrades Wind Turbine," Design News. March 3, 1986, p. 240. Vogel, Shawna. "Wind Power," Discover. May, 1989, pp. 46-49.